I learned to drink the lighter beers with flavours when I was still in highschool. Yeah, you know, highschool days are full of curiosity and experiments. Well, in most occasions, I always pick beers more than any other liquor products especially when I'm in events wherein there's no iced tea or sodas available for order. I'm a nurse and I know that beers are still better in lowering the risk of kidney stones compared to their hard liquor loving friends because of its high water content and diuretic effect. That's my best excuse to my Mom when she caught me drinking beer on the apartment years ago. You can use it too as an excuse when you get caught by your parents. Haha! That's funny but true. 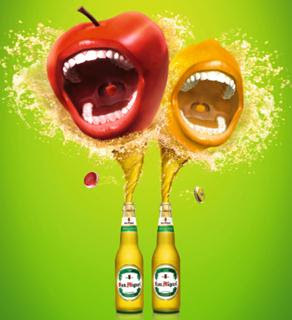 As the years go by, the level of beer leveled up, just like San Miguel which now offers flavored beers – apple and lemon. Beers were flavored for us to fully enjoy the taste of a beer without the bitter taste. The taste of this is… unusual. The apple elements are there, which made me expect it to be sweet. But it’s a beer, so it’s decidedly beery. It pours out very fizzy, but the head doesn’t last long. Though it was sweeter than your standard beer, I was surprised it wasn’t more syrupy-sweet. So fresh! Smooth with a touch of sweetness. The creativity behind this beer was great, and it was a smooth, tasty golden ale. It smells as though you’re standing in the middle of a meadow filled with fruits and grasses. Flavor-wise, it may add a light (but full-tasting) sweetness and slight tangy-ness. Beer and lemon are really the most prominent flavors in this beer . I love beers because it relaxes my body and senses, I love to drink it after a hectic or stressful day, it’s a reward for myself for a job well done or just a drink for me and my buddies to enjoy our bonding times more. Anyways, either, beer or lemon, these two give the beer the right flavor with a couple of shakes, and it's easy to carry along. 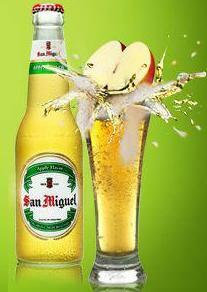 Apple and lemon - These two are the first and best fruit-flavored beer San Miguel has ever brewed. Quirky and imaginatively unique. A fruity twist to the refreshing qualities of beer. Make sure enjoying the fruity flavors of San Miguel Flavored Beer is on that list. Available in selected bars and restaurants nationwide!